Has anyone ever asked you, "how much you bench bro?" Were you embarrassed by your answer? I've had a love/hate (mostly hate) relationship with the bench press. Being a lanky guy, I don't have the ideal build for the bench. That never stopped me from trying though. Before I learned how to bench press correctly, I hurt my shoulders on multiple occasions. If you've hurt your shoulders, you know how frustrating it can be. I'm finally back to benching some decent weight without pain. With that being said, let's get to the point. 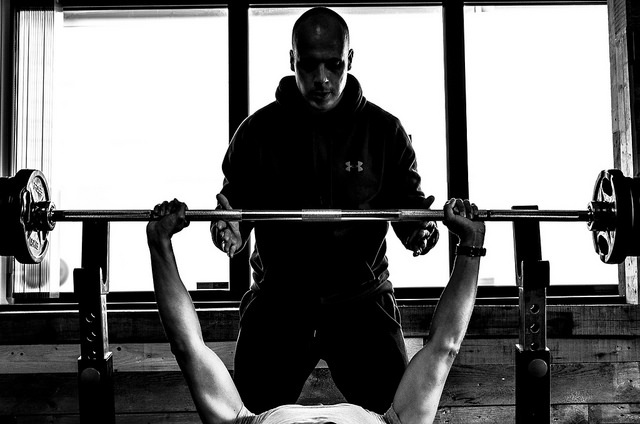 How can you improve your bench press and stay injury-free? Let me start out by saying that everyone is built differently so you will have to adjust some elements of the bench press movement to suit your own body structure. Shoulder position- BACK and DOWN- this one took me a long time to figure out but once I did, I could bench press with no pain. Never let your shoulders roll off the bench. If you think of only one thing during the bench setup and execution, think of keeping your shoulders bunched up together and pulled down into the bench. Chest UP- After you get your shoulders back and down into the bench, stick your chest up. This will give you the arch in your back. Try to keep your chest there. BIG breath- Before you take the bar out of the rack you want to take in a deep breath. Unrack the bar and move the bar to the starting position. Your shoulders are locked into the bench, your chest is up and now you have a big breath of air. Your body is tight and ready to execute the lift. I usually take another small breath at this point, then bring the bar down to my lower chest. Elbows Tucked- You want to tuck your elbows as you bring the barbell down to your chest. The exact amount of "tuck" will depend on your build, grip width and where you touch the bar on your chest. Don't tuck your elbows SO much that you lose power, and end up looking like you have t-Rex arms. Those are the keys that I have focused on to bring my bench from painful at any weight, to now benching almost my all-time max. Speaking of a max...There is rarely a need to go to a true one rep MAX. I haven't come near a one rep MAX since I rehabbed my shoulder back from the injury. Work in the 5-8 rep range for the majority of your bench press training. Sometimes I go down to sets of 3-4 reps and I include some singles in my training, but they are NEVER a true 1RM single. There's just no need for it, especially if you aren't competing in powerlifting. Once in awhile you can test your maxes. Have a "mock meet" to see where you're at. There's nothing wrong with that. Just remember you are building strength for the majority of your training, not testing strength. I hope these tips help you improve your bench and stay injury-free. If you need help programming your bench or other lifts, I have a new training template I am writing that may interest you.